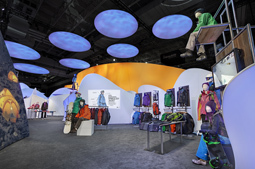 At MOD '11, an annual event celebrating the best in lightweight, modular, and sustainable exhibit design, Transformit won "Best Green Exhibit" for the 60' x 100' exhibit that we designed and built for The North Face. The award ceremony was attended by over 300 industry professionals, who participated in the selection, along with judges, Derek Gentile of EEI Global, Russ Fowler of Derse, and Gino Pellegrini of Inter-Global Exhibits. 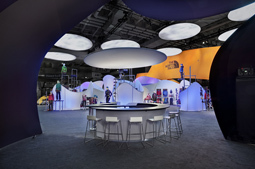 In July 2010, The North Face art director, Caleb Brown, approached Transformit to help design their new exhibit for Outdoor Retailer, a twice-yearly industry show in Salt Lake City, UT. 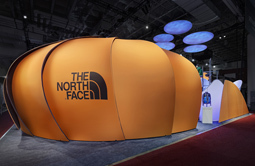 For years, The North Face had exhibited privately, in meeting rooms away from the main show floor. 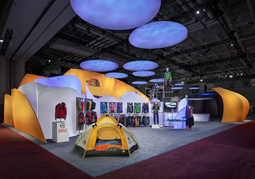 New management wanted to rejoin the activity on the show floor, and to invite the entire show audience to experience The North Face. 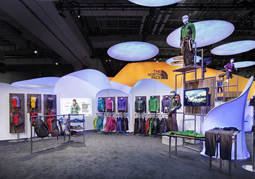 Caleb expressed that their intent was to assert The North Face's leadership position in both technical innovation and sustainability, deliver an exciting brand experience to visitors, and display six groups of products in areas clearly delineated by activity: Outdoor, Performance, Action Sports, Youth, Equipment, and Footwear. Perfection in execution was expected in the product display. To begin the design process, Caleb came to Transformit to develop the design with our team: Tom Newhall and Tom Chabot, Senior Desigers, supported by owner Cindy Thompson and vice president of marketing, Matt Rawdon. Caleb's presence allowed us to sit down together to quickly test, reject, and modify many ideas. From our initial wide-ranging conversations emerged three core ideas: 1) the exhibit was to express the company's deep roots in outdoor equipment, specifically The North Face's iconic dome tents; 2) the design was to be proportioned after the ancient Greek "golden section" or "golden ratio" and; 3) it was to demonstrateThe North Face's commitment to environmental stewardship. 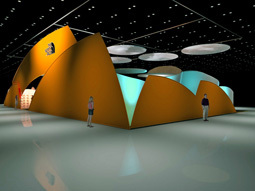 The exhibit was centered around the circular Summit Bar, shaped to resemble the logo of the Summit Series of high-end products. Intended as the central meeting point for visitors, the bar sat in the opening of the Half Dome theater, where live presentations were made, and amazing videos of sponsored athletes were shown in a controlled environment. Spiraling away from the theater and bar were product display areas, each area being defined by a 14' tall "cairn" (the term for trail markers made from pile of rocks), an appropriately dressed mannequin, and associated product displays. 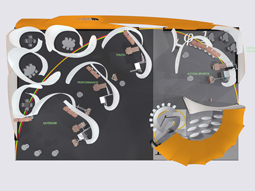 In each product area, a video monitor and a digital projector showed motion graphics and video related to that area. In one corner of the exhibit space were four private meeting rooms named after famous mountain ranges. Overhead, following the spiral arrangement of the floor plan, were suspended circular clouds, onto which lighting was projected from below. 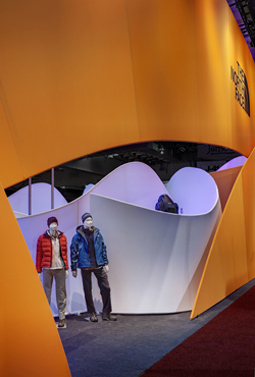 Three sides along the perimeter of the exhibit space were flanked by very large tent-like shapes in The North Face's signature yellow-orange color. The Summit Bar's top was made from PaperStone, a durable material made entirely from recycled paper fused together with resin made from cashew shells. 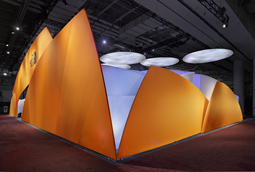 The theater walls, meeting rooms and clouds all had inner linings made from PolySoft, Transformit's shape-conforming, sound-absorbing fabric. The meeting rooms and theater became an oasis of quiet in the cacophony of the busy show hall. 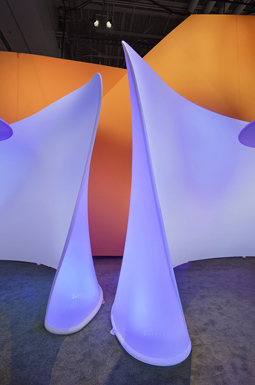 The walls of the meeting rooms and product area dividers were internally lit by glacier-blue LEDs. 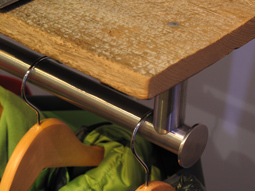 The product displays and cairns paired highly developed stainless steel structural elements with panels and shelves made from reclaimed barn wood, much the same as The North Face's highly technical products coexist with the company's long history of environmental stewardship efforts. 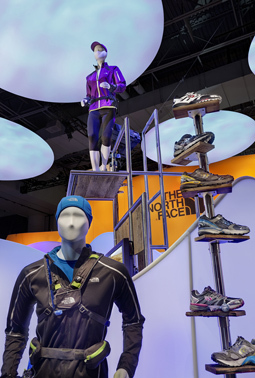 These displays were adapted for trade show use from designs by Gensler that were used in a prototype store. 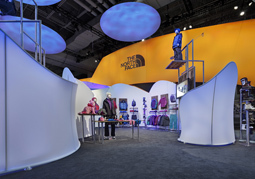 Transformit made them modular and adjustable, and they were configured by The North Face merchandisers in creative ways not imagined when they were designed! The overall look of the curvy white walls piled up together was one of a snowy mountain range, calling to mind John Muir's name for the Sierra Nevada: "Range of Light". 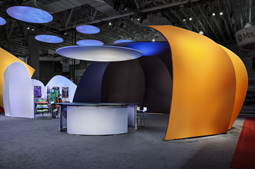 The entire exhibit design was modular: subsets can be used for smaller shows or showrooms, and the exhibit can be easily reconfigured. A large exhibit at 6,000 square feet, it weighed less than 15,000 pounds. 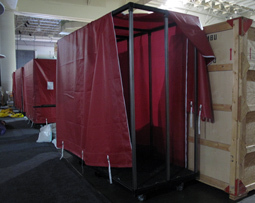 When packed, it fit into six steel carts that were enclosed by fabric covers. The carts could be fork-lifted, or wheeled by hand on their built-in casters. The carts only consumed 32 feet of a 53 foot trailer. Nearly all of the exhibit will be recycled or repurposed at the end of its life. 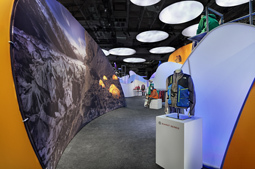 The North Face is in the process of conducting an "Eco-audit" of the exhibit's carbon footprint. 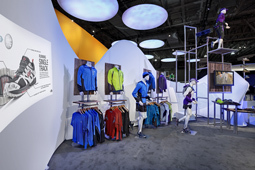 The exhibit made its debut at Outdoor Retailer Winter Market 2011, to enthusiastic reviews by show attendees and The North Face employees alike. It was awarded Best Booth Overall by SNEWS, an independent trade news magazine. All of us here at Transformit are proud to have produced an exhibit that has been awarded both "Best in Show" and "Best Green Exhibit"!